Yellow-cedar cone and leaves. Top left: branch with leaves, photo by Brian Starzomski. Bottom left: seedling, photo by Kelly Fretwell. Top right: a maturing cone (photo by Andrew Trant). Bottom right: immature cone (photo by Georgia Brander). 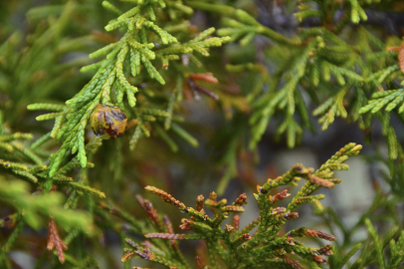 Yellow-cedar typically grows 20-40 m tall and has drooping branches with flat, feathery sprays. The blueish-green scale-like leaves grow partially overlapping and close to stems. Yellow-cedar has grey-white to grey-brown bark arranged in vertical strips that flake but don't tear off in long strips. The cones of this species are small (less than 1 cm across) and berry-like when immature. The cones become brown, woody, and popcorn-like in appearance as they mature, developing 4-6 mushroom-shaped scales. In the southern area of British Columbia yellow-cedar is typically found in moist to wet sites and rocky sites at middle to high elevations, though on the west coast of Vancouver Island it is also found at sea level. 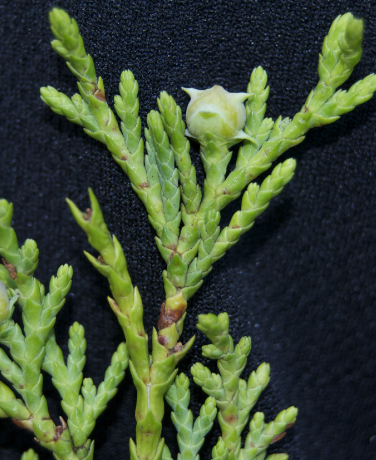 From north of Vancouver Island to Alaska it is more commonly found in wet bogs and bog forests. It can take on more of a shrubby appearance in muskeg and near the treeline. Yellow-cedar is very similar to western redcedar (Thuja plicata). There are several differentiating characteristics, however. Redcedar branches have an upward lift at the end of the branches, forming a 'J'-shape, while yellow-cedars branches droop downwards. Yellow-cedar leaves emit an unpleasant smell like mildew when crushed, as opposed to the traditional and pleasant 'cedar' smell of redcedar. 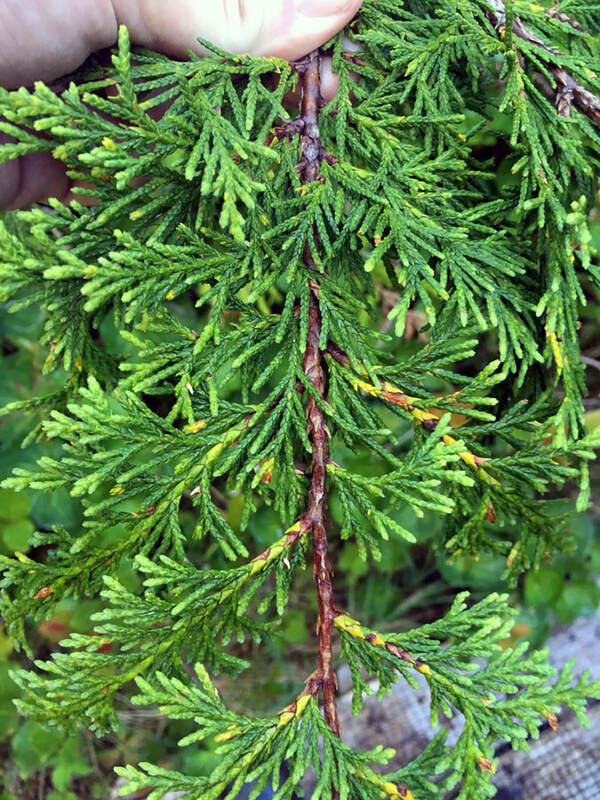 Yellow-cedar leaves are also prickly when stroked 'against the grain' while redcedar leaves are not. In addition, redcedar bark comes off in long strips, while yellow-cedar bark flakes off in smaller sections. The cones of the two trees are the key identifier: redcedar cones start as small green egg-shaped cones and mature to woody brown cones with 8-12 scales. 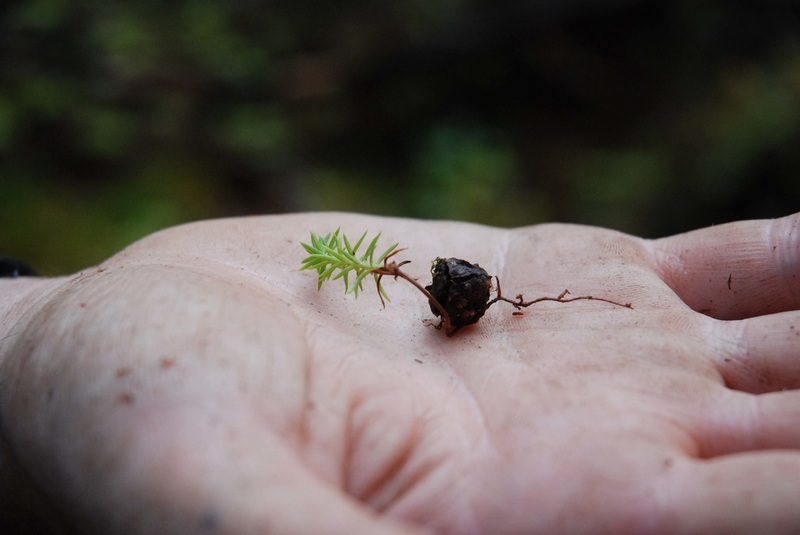 For a long and detailed consideration of the two cedars' similarities and differences beyond simple identification, and an amalgamation of work done on the species, see A Tale of Two Cedars: International Symposium on Western Redcedar and Yellow-Cedar. Like western redcedar, the yellow-cedar was used extensively by the Indigenous Peoples of the Pacific Northwest and had a place in mythology as well. The wood is, like redcedar, strong and straight-grained, which makes it ideal for making a variety of implements, including bows, paddles, masks, chests, dishes, and handles. The tree also has traditional medicinal uses: the Kwakwaka'wakw used the branch tips in two different teas, one on its own to treat insanity, and another with spruce roots to treat kidney ailments. The species was also used with a sweatbath to 'scare away' disease or treat rheumatism. A search on the University of Michigan - Dearborn Native American Ethnobotany website yields 62 distinct uses for yellow-cedar. Yellow-cedar trees are very long-lived, with individuals commonly reaching 1000-1500 years old. Yellow-cedar abundance has been declining for many years, although researchers are unsure why. Recent research has suggested that changes in the amount of snowpack may play a role. Visit the UBC Botanical Garden and Centre for Plant Research for more information. *There are numerous scientific names presently attached to the yellow-cedar. The IUCN Red List and International Botanical Congress use Xanthocyparis nootkatensis, putting the species in the same genus as a recently discovered tree in Vietnam. Other sites list it under the old genus Chamaecyparis, and it is also found as either Cupressus nootkatensis or Callitropsis nootkatensis. For more information, click here. Cupressus nootkatensis. Wikipedia, the free encyclopedia. Accessed 28/04/2013. Mosquin, D., Klinkenberg, B., Wooten, C. (2010). Chamaecyparis nootkatensis. Botany Photo of the Day. UBC Botanical Garden and Centre for Plant Research. Accessed 28/04/2013. Pojar, J. and MacKinnon, A. (2005). Plants of Coastal British Columbia, Revised. Vancouver, BC: Lone Pine Publishing. P. 43.